Low polygon models are designed to provide a smaller footprint, lowering file sizes. 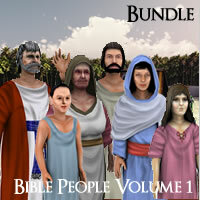 Populate your ancient world artwork, religious, fantasy and more with Bible People villagers! Low polygon models. Professional versions for 3D Studio MAX and Shade, Special Poser version and Standard Version. Six complete models, each with three texture sets. 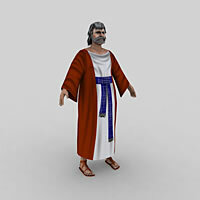 Low polygon, ancient world old man model with five different texture sets. Professional versions for 3D Studio MAX and Shade with game licensing. Special version for Poser. Standard versions for almost all 3D Software. 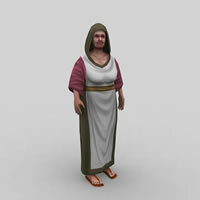 Low polygon, ancient world old woman model with five different texture sets. Professional versions for 3D Studio MAX and Shade with game licensing. Special version for Poser. Standard versions for almost all 3D Software. 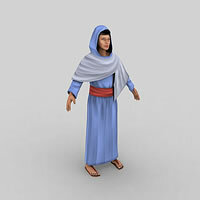 Low polygon, ancient world boy model with five different texture sets. Professional versions for 3D Studio MAX and Shade with game licensing. Special version for Poser. Standard versions for almost all 3D Software. Low polygon, ancient world girl model with five different texture sets. Professional versions for 3D Studio MAX and Shade with game licensing. Special version for Poser. Standard versions for almost all 3D Software. 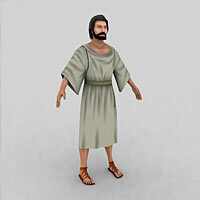 Low polygon, ancient world man model with three different texture sets. Professional versions for 3D Studio MAX and Shade with game licensing. Special version for Poser. Standard versions for almost all 3D Software. Low polygon, ancient world woman model with three different texture sets. Professional versions for 3D Studio MAX and Shade with game licensing. Special version for Poser. Standard versions for almost all 3D Software. A free, game optimized model for Unity 3D, iClone, Shade and any FBX compatible system.